Once again, our very own Palawan Island has become the cover photo of the most popular magazine in US, the Travel and Leisure. It is Philippines Pride. This just means that we have a lot of good and beautiful nature that we must care. 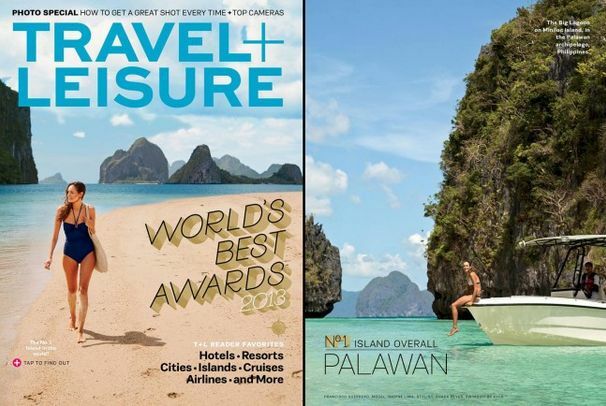 The Philippine pride, El Nido Resorts in Palawan has landed on the cover of Travel + Leisure, in its “World’s Best Awards,” August 2013 issue. The magazine features El Nido Resorts sandbar, particulary the Big Lagoon of Miniloc Island. The shot was also taken by Filipino photographer Francisco Guerero, one of the US’ most popular photographer, he previously landed the covers of previous issues of both Travel + Leisure and Conde Nast Traveller magazines. The special August Issue of one of the world’s most popular travel magazine, the Travel + Leisure put Palawan in the limelight, the image features the Big Lagoon of Miniloc island, and the scenic and lush location of Bacuit Bay in El Nido, Palawan. According to Laurent Lamasuta, president of El Nido Resorts, he stated that, “It is with great pride that El Nido Resorts was chosen as the cover of the Travel + Leisure US’s World’s Best Awards 2013 Issue this August. It brings recognition not only to our resorts and all the staff who have formed part of the protection and preservation of its natural beauty, but also to Palawan and the Philippines. It certainly gives a boost to the Department of Tourism’s efforts in showing the world that “It’s More Fun in the Philippines,” as it reaches an even larger market.” Lamasuta stated. The El Nido Resorts received some recognition earlier this year, they have already garnered the Tourism for Tomorrow Community Benefit Award by the World Travel and Tourism Council. The award is proof of the efforts made by resort owners to create sustainable ec0-islands, protect and preserve the environment, and enrich the lives of its local communities.